16 miles on the schedule today - done but tired after Crim yesterday. This was one of the hardest runs I have done this year. I had an awesome opportunity to review a pair of TrekSta Evolution II trail shoes. Mike over at TrekSta was kind enough to send me a pair of these to test and review. I got these in the mail about a week ago, just before I went on my trip up in Northern Michigan. I asked Mike if he would be able to get them to me in time because I really wanted to test them out on all the trails up there. He sent them in 2 day mail so that I had them for my trip! He was super nice about it. I mean, here I am, asking for a free pair of shoes, and then on top of that, get them to me fast? I can only imagine the kind of service the company provides to all its client - top notch! Comes with Orange laces to pop out at you! These are made with TrekSta's Nestfit - It's a shoe built around the actual shape of your feet! Very cool feature. I laces these babies up and tried them out - 8.5 - perfect fit! These shoes also come with Icelock - it helps improve traction in icy conditions. Sorry, I can't say that there was any snow where I ran with these but I am anxious to try them out in the winter too. Given their comfort, they will likely be one of my "go to" shoes for wintertime running. I'll post about the snow running(yuck - don't want to think about it) in these but I'm sure they will be great. I love the way that these feel part of your feet. They have a really nice size toe box to allow your toes to spread out in comfort. This is one feature that really makes these shoes feel comfortable. They also fit well everywhere else and wrap your foot nicely. Ok, so they are comfortable sitting at home but how about on the trails? An unbelievable trail shoe? Absolutely!!!! Now normally I like to break in my shoes a little and walk with them or run with them very short distances but since they were so comfortable, I only took these shoes with me up north for the trails. I was really taking a chance since I did not know how they would do and I NEVER use new shoes they way I did with these. My first trail with these was a six mile hike along Tahquamenon falls. My family and I hiked between the lower and upper falls which is four miles but all our other walking in the area was another 2 miles. My feet felt fantastic the entire time. Nothing was able to get into my shoes because the tongue of the shoes is sewn up the sides to help prevent anything from getting into them. 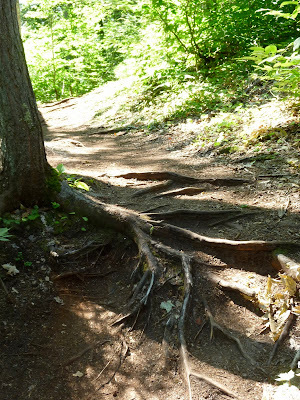 This trail had it all too - mud, tons of tree roots, hills, downhills, sand, rocks, water - you name it, it was on this trail. 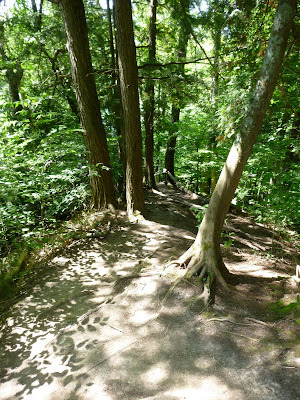 The trail was labeled as moderately difficult but the shoes made it seem easy. Then it started. Roots and big rock. Yes, this IS the trail. The Evolution II made this trail feel easy. The shoes would grip the trail like glue. As you can see, I'm having a great time. Thanks to having the proper shoes to wear for this trail, I made it out feeling really great. I think that's one sign of a great pair of trail shoes. Any really, who wants to be thinking about your feet the entire time your on the trail. As you can see from the following pictures, the trails were littered with tree roots so you really needed to be extra cautious out there. I sliced through the trail like butter with my Evolution II. And they helped keep me steady on wet tree trunks as well! 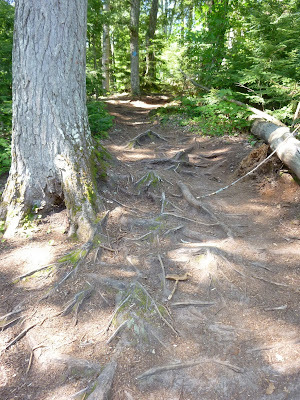 The shoes were equally comfortable on the single track trail parts such as the picture below. I ran parts of these as well to get a good idea of the comfort while running in them. They are a great trail running shoe. As you can see from my dirty socks, the shoes were well tested on this trail and they did awesome! The next trail that we visited had more of a easy trail. 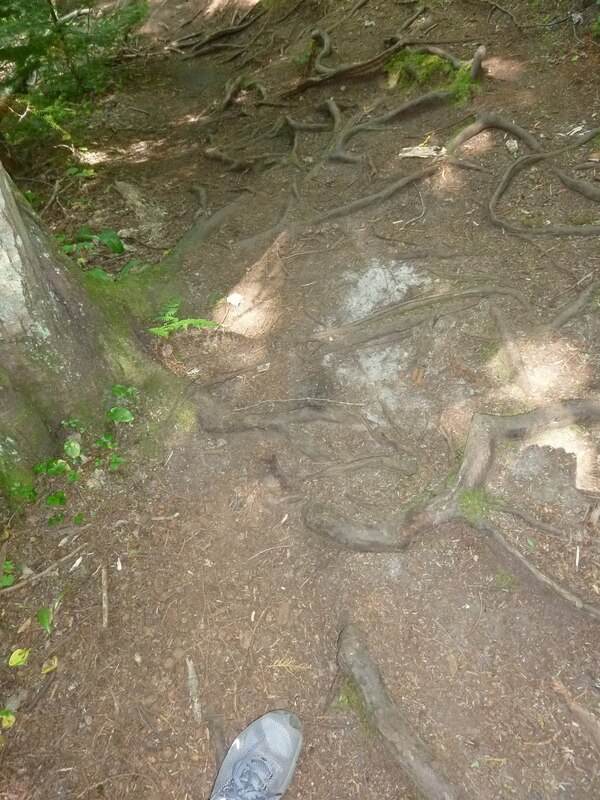 Not much in the way of tree roots but soft ground cover that would simulate what it would be like running on a dirt trail. Well, not really simulate, since it was a dirt trail. Haha! Once again, the shoes performed flawlessly. Here is part of the trail where there was sand. I'm not really a person that likes to walk/hike/run in sand but again the Treksta shoes handled the terrain with precision. Not only that but after walking for several hours there was no sand/dirt in my shoes. 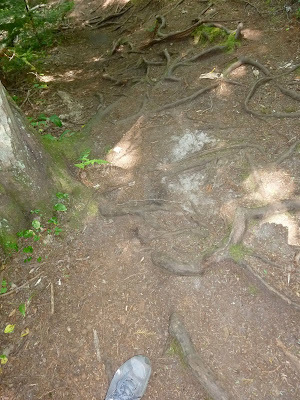 As you can see, there were logs in the middle of the trail to help with soil erosion from the rains there. More tree roots up everywhere. This really is the trail believe it or not and the Evolution II handled them flawlessly again. I even had the confidence to go out on this edge of the cliff(although I would not recommend it) with my trail shoes since the grip on these things was so good. 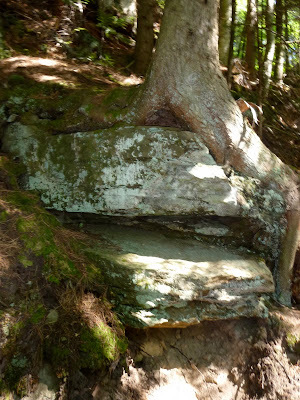 Here are the Evolution II on the same trail but with more sand and rock to run through. Easy peasy! 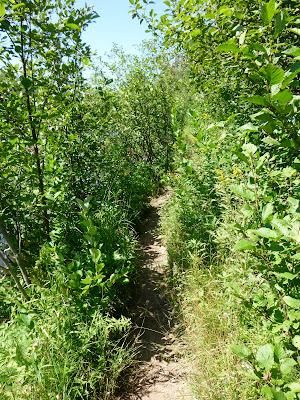 If I had my regular running shoes on, I would not have been able to get through these trails as easily and would have had to slow down tremendously. These trails were a great test to the Treksta Evolution II's ability in all running surfaces that would be encountered on the trail systems. If you are not on the trail but just need a pair of shoes for everyday, I would also recommend them due to their comfort. You will not be disappointed. If you love getting on the trails, these are a "must buy"
Like what you read here? Please check out TrekSta's website(click HERE) for even more choices. * I was sent a pair of TrekSta's Evolution II trail shoes from TrekSta at no cost in exchange for a review of their product. All opinions expressed in this review are my own and I was not required to give a favorable review. Have a great day and......Keep Running!!!!!! !